Best pair of boots I've purchased in years! Great for Chicago winters/springs. I get complemented every time I lace em up! They fit well with one pair of thin socks or even a thicker wool sock. 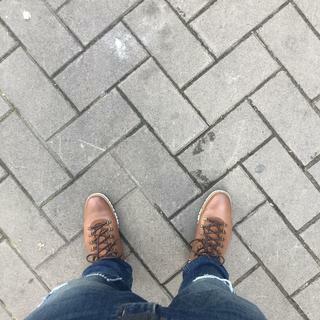 I love this Boots, nice compliments everytime i wear it. My best boots ever. Light weight and comfy. I love this boot it’s comfortable and very stylish! I get tons of compliments every time I wear them. They are not a cold weather boot. Bottoms are slick in the snow, and they are not very warm. They look great with my dress pants or jeans, and are not too heavy. Comfortable boots that are great for any wet weather or snow. They keep your feet warm and the style looks great. This boot is not oversized. Looks great with all types of pant. One of the best pair of shoes I ever purchased, and I am over 60 years old. Extremely comfortable and stylish. Fits true to size. Water resistantance is functional. Great light weight boot, very happy with the style. I wear these boots daily and they are great. We bought these as a gift for our 22 year old son in college. He absolutely loves them. Wears them all the time. They are comfortable and very practical for northern Missouri climate. It was his favorite gift on Christmas. The boot itself is fantastic- comfortable, lightweight, and really sharp looking. All of those saying to order a size up, however, are confused. I wear 11s across the board, but considered ordering a 12 based on the reviews but stuck with 11. They're a full size too big- I could have easily ordered a size smaller and they would've fit perfectly. Sale item, so no returns or exchanges. Thankfully there's so much lacing that my foot doesn't slide and they're still wearable. By far the best shoes I have ever owned. Been wearing them for over a year and stilll get compliments regularly!! Purchased this about a week ago and I've worn it several times - very comfortable and light (feels like sneakers), great look, received a lot of compliments, works well in the rain. My one complaint is the quality of the laces, very stiff and poor quality, does not hold when you tie a knot. Overall however, it's a great product and definitely recommend for business or casual wear. I was very hesitant to purchase these but they are some of the best boots I've ever owned. They are extremely comfortable and I can even pull them off at work. Would buy again. My favorite pair of boots now! Very well made boot. Awesome fit and finish. I always order a half size smaller than my running shoes and these were spot on. Very sharp boot. Zero grand is comfortable enough to wear all day and night. Was looking for something stylish and practical...found it! I was looking for stylish boot that not only looked great, but worked as a comfortable, weather resistant work boot, and this boot fits the bill. I really enjoy the light-weight comfort and good looks. I also get many compliments and they look great with my casual business style in in-climate weather. Looking forward to wearing them for a long time to come. Have wanted this boot for awhile and was my first Zerogrand edition to add to my Cole Haan collection. Have been impressed with its durability and dexterity. Also love its features including the rugged sole and heavy boot laces. Be sure to condition it properly before getting it wet just to protect the outer leather skin from the wet climates. Overall highly recommend for comfort fit and style!!! They have great traction, comfortable and stylish. As for warmth, wear thick socks but go up a half size to stay comfortable. High quality Cole Haan and an attractive winter boot. I loved my women's zerogrand boots and my husband wanted a pair after I raved about mine. Like the looks and we know from previous experience Cole Haan makes an excellent shoe! the style and hopefully it's comfortable and warm for walking around in! Style + Durability. I've purchased four pairs of Cole Haan shoes in the last 18 months after a period that I stayed away from the brand (they looked too much like the sneaker company that owned them at that time). I feel like Cole Haan has gotten back to design in aesthetic, comfort and utility. I bought my first pair of Cole Haan loafers 40 years ago. Looking forward to these next 40. I love the Zerogrand sole and needed waterproof shoes. These look great and I am happy they come in Wide too. 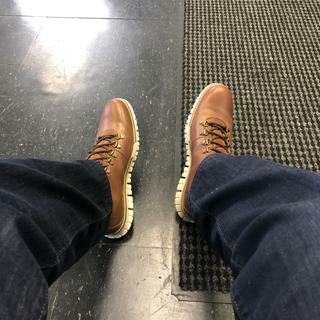 I have bought two other pair of cole haan shoes and really enjoyed them. I look forward to wearing these boots on long hikes. I bought the all black zerogrand water resistant hiker boot and love it. Therefore I had to have the brown version as an alternate boot. Looking forward to Cole Haan coming up with more colorways. Because it looks like a polished yet durable and effective boot for me to wear in all types of weather. Being in the northeast, snow and ice are a big part of winter weather so having a boot that fits nicely, is durable in cold weather, and looks great was a must. My husband loves Cole Hahn – these are very comfortable and look stylish –perfect! I needed a new pair of boots and love my other ZEROGRAND products! TOP OF MY SON'S XMAS LIST! I liked that they are lightweight, water resistant, and look good. need a good looking somewhat warm shoe that is comfortable. I am a pharmacist and stand for long hours and with the drive through window, my feet are cold in the winter with dress shoes. From the customer service reviews it looks like these shoes will be appropriate. Bought these last year and loved them. But the soles are worn out so I decided to get the same pair. Nice lines to this bot. Rugged but elegant. I have the same style in black and wore them while in Whistler Canada. Warm and comfortable as well as snow/waterproof. Works well in the snow, but be careful on ice as the sole doesn't have as much grip as I would have liked. It looks great! My wife saw it a window and told me to get it! Feels Like a tennis shoe. If I could buy each style of Grand I would!!! Do the boots run big in size? BEST ANSWER: No, most run small. Chances are you want to go a half size up. That seems to be the general consensus with Cole Haan boots. I usually wear an 11 but had to get a 10.5 after the 11 was too big. I’d say they’re consistent with all another Cole Haans, which in my experience run a half size big. Not only do they run true to size but they are very comfortable. I wear a size 9 and they fit perfect. The W were too big. The size 10 boots I ordered ran completely true to size. No. If anything they are a bit on the narrow side. for me, they ran true to size. Yes they run a half size big. Should you waterproof spray these boots before wearing them? BEST ANSWER: I did waterproof mine to preserve them. So I would recommend waterproofing them. I didn't water proof mine and they are fine. But I would suggest wiping them down afterwards if you've been on the streets where salt, chemicals, etc. was used, just to keep them looking better. Is this boot slip resistant? BEST ANSWER: Overall yes, it’s a pretty solid booth that provides moderate slip resistance. I haven’t personally had the opportunity to wear it in conditions where snow or rain was a factor. Yes, I've had no issues in rain or snow. How do these shoes hold up in the snow? These are as far from a winter boot as you can get. And the quality is that of something worth about 5 dollars. I think they work fine, but I wouldn't expose them to a ton of snow day after day. BEST ANSWER: Yes they are. These boots are worth every penny! do they help in keeping foot warm in winter months? BEST ANSWER: They are wearable in winter, however the layer protecting your foot is leather (with no additional insulated liner on the outside that a more traditional "winter boot" would have). Great boot for Fall and moderate winter temps. Yes! These shoes are very insulating, they are my goto winter boots. I would still recommend wool socks for extra warmth and comfort. Indeed they do and being waterproof is a major plus! Yes with a very nice pair of socks, love them!!! BEST ANSWER: I wear these throughout the frigid Chicago winters and my feet are very cozy when paired with proper socks. I have never complained about them not being warm enough. These boots are reasonably warm; however, I wouldn't rate them "resistant," to cold. They are very comfortable and look great with casual pants and jeans. No. They are pretty thin. Is it soft leather on the upper? BEST ANSWER: The leather is soft and the boot is comfortable, not warm but comfortable. Does the width increase by size as well or just the length? BEST ANSWER: Width increases incrementally and proportionately by size. How long are the laces on size 11.5? Want to order some replacements. BEST ANSWER: Standard measurement for a shoe with 8 sets of eyelets is 63-72". We don't sell replacement laces, but we do recommend a visit to www.shoelacesexpress.com - virtually every kind of lace can be found there. Also can visit a good shoe retailer or shoe repair shop.